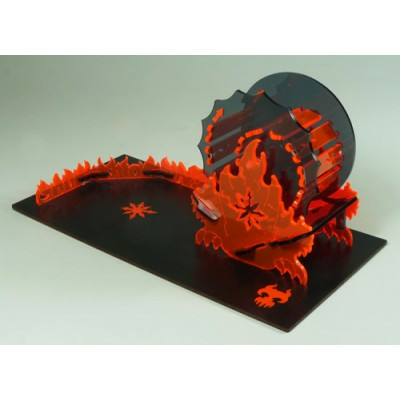 Chaos Flame dice tower is created in the Chaos style of Warhammer Universe. Chaos is Chaos: a random collision of dice leads to an unpredictable result. Turn the flaming wheel and enjoy the music of the eternal motion of the universe. Chaos Flame dice tower is suitable for games when you want to throw a lot of dice of different sizes. •	Chaos Flame dice tower is a prefabricated model. •	There is attached assembly diagram. •	Its complexity is easy. •	The dimensions in assembled form are 8.5 x 11.5 x 14 cm. The size of the plank is 14.5 x 29.5 cm. •	Materials: Plexiglas, laminated HDF. The Chaos Flame dice tower mixes a variety of dice: 7-mm "mushroom D6 of WarHammer’s goblins", 22-mm "Magic the Gathering D20", and even unwieldy and even unwieldy tetrahedrons. Put dice inside the spiral (which always stops in the correct position) and turn the dial clockwise. If there is not many dice you can untwist strongly; if there are a lot of them, make your move weaker, so the dice can roll on steps. Then stop the disc and gently turn it counter-clockwise until it stops. The dice will be poured out.